The gradual rise in oceanic acidity is weakening the shells of shellfish, corals and sea urchins, making them vulnerable to predation and damage from oceanic movements. Many marine animals produce protective shells and exoskeletons from calcium carbonate from seawater, but higher CO2 concentrations absorbed into seawater from the environment is lowering the oceanic PH. This makes conditions more acidic and is affecting the strength of shells making the animals weaker against predators such as crabs and other marine life. 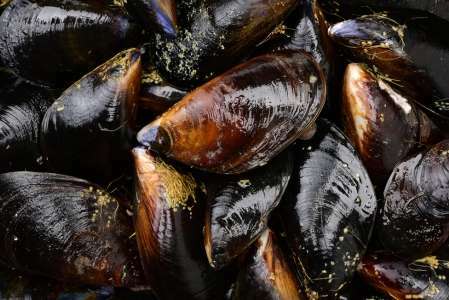 But new research at the University of Glasgow shows the humble mussel is fighting back by adapting and evolving to the sea changes. In a new paper, published today (February 15, 2016) in Scientific Reports, researchers from the University of Glasgow found mussel shells grown under ocean acidification produce more amorphous calcium carbonate as a repair mechanism, compensating for the impact of environmental changes. With growth in global industrialisation, the surface pH of the oceans has declined form pH 8.1 to pH 8.0, meaning the water is less alkaline. Increasing CO2 leads to ocean acidification and scientists expect a further reduction in alkalinity from pH 8.0 – pH ~7.7 by the end of the 21st century. above 'mussels are compensating and adjusting to environmental change' to "The mussel shell composition is changing in response to the environmental change." Dr Susan Fitzer, from Geography and Earth Sciences at the University of Glasgow, who led the research, said: "Many marine organisms are being directly affected by these changes. They need calcium carbonate to produce their shells and exoskeletons from calcium carbonate, but higher acidity reduces the concentration of carbonate ions available for shell formation and subsequently their shells are becoming more brittle which makes them more vulnerable. "Our study found that mussel shells grown under ocean acidification produce more amorphous calcium carbonate and had less crystallographic control over shell growth. This shows the mussel shell composition is changing in response to the environmental change." Mussels were found to have reduced growth and altered material properties when grown under future projected ocean acidification conditions. The shells became harder and less elastic resulting in them being more prone to fracture in stormy environments and more vulnerable against predation. Dr Fitzer led the research with a team of scientists at the Diamond Light Source. The team used synchrotron X-ray Microscopy to investigate the influence of ocean acidification on amorphous calcium carbonate formation within mussel shells. Marine organisms, such as mussels, producing calcium carbonate shells, mould a solid crystalline structure from the natural disorder of amorphous calcium carbonate. Dr Fitzer said: "Research suggests that mussels induce amorphous calcium carbonate as a repair mechanism to combat shell damage under ocean acidification." "These phase transitions from amorphous calcium carbonate to a crystalline structure are important to understand how marine organisms such as mussels produce their protective shells. Mussels use amorphous calcium carbonate to transport insoluble materials to crystalisation sites for growth and repair." Despite the findings, the mussels' adaptation may be insufficient. The impact of rising oceanic acidification on the crystalisation of mussel shells still raises concerns for the protective function of shells, in order to protect animals against predation and stormy environments.